Each year, for the 6+ week Lenten season, we try to come up with some specials that will keep you (and us) interested all the way to Easter. We try to mix it up and give everyone something worth giving things up for... from the standard fish and chips to a very healthy marix marinated grilled shrimp tacos. For the fish lover, we have a great pan seared orange balsamic glazed steelhead salmon, and for some decadence we feature our broiled South African lobster Tail. Next week we will cover a couple of these specials in greater detail. 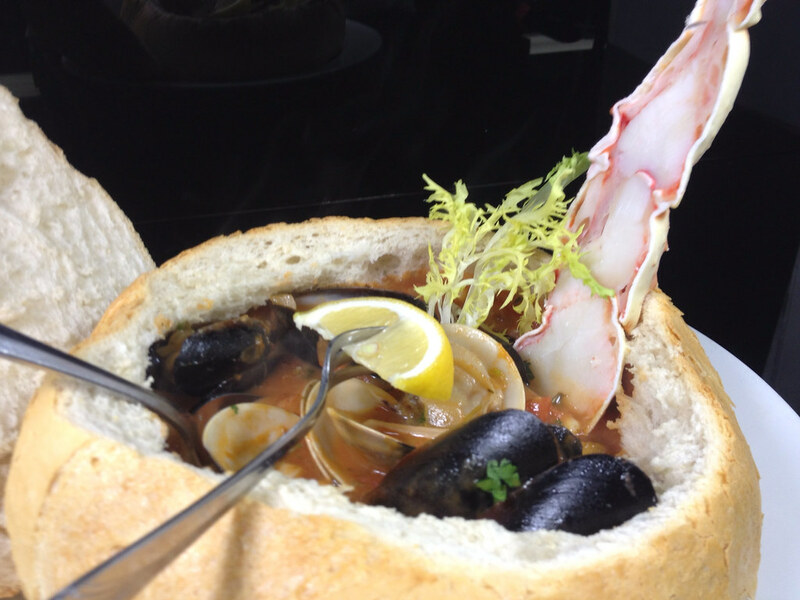 The one I feel is the most interesting is our San Fran Sourdough Cioppino. This dish came together in our kitchen. This is not a stolen idea or something copied from somewhere else. It kind of came together like the peanut butter cup, by accident. If someone else is doing it, we don't know where. Cioppino is a seafood stew that originated in San Francisco. San Francisco is also famous for some really good sourdough bread. So when we started tossing around the idea of serving a Cioppino for Lent, we thought "why not toss it into a sourdough bowl?" Usually Cioppino is served with toasted sourdough... we serve it in toasted sourdough. What a great combination - and a great presentation! We start by sauteing all of the following: Alaskan king crab, grouper, halibut, sea bass, shrimp, squid, mussels, and clams. We add a Cioppino base (a flavorful Italian tomato wine broth) and let it simmer for a few minutes. Then we serve it in a toasted, hollowed out 20 ounce loaf of San Francisco Dough. We hope we are not being too irreverent during Lent, but we think when we serve it you will say "OMG!"